Bingerville is a town in south-eastern Ivory Coast. 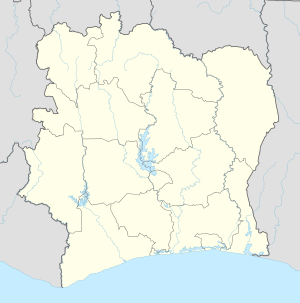 It is a suburb of Abidjan and is one of four sub-prefectures of Abidjan Autonomous District. Bingerville is also a commune. The town is about 10 kilometres east of Abidjan and lies on the Ébrié Lagoon. Originally a market town, Bingerville grew as the capital of the French colony from 1909 until 1934. It is named after Louis-Gustave Binger, a former French colonial governor. Many colonial buildings survive in the town, which is also known for its botanical gardens. Villages in the sub-prefecture include Eloka. Bingerville is home to École militaire préparatoire technique (EMPT), a military academy. Prior to the 2011 reorganisation of the subdivisions of Ivory Coast, Bingerville was part of the Lagunes Region. ^ "Côte d'Ivoire". geohive.com. Retrieved 15 December 2015. This Abidjan location article is a stub. You can help Wikipedia by expanding it.